My husband has a Honey fetish along with a life long dream of being a bee keeper. I have been meaning to make some kind of recipe with honey in it for ages and only just got around to it this weekend. Doesn’t hurt that I just bought a copious amount of honey at Costco and also had two containers of honey with dregs that needed to be finished. 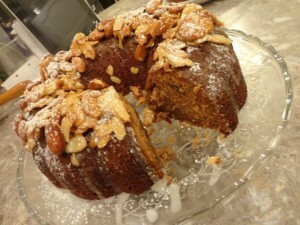 Now I know the Honey Cake looks pretty with the Honeyed Almonds on top but in hindsight, the topping was a bad idea. Tasty, but a bad idea because the Honeyed Almonds was pretty much Almond Bark minus the chocolate. Again, tasty, but a bad idea for the top of a cake. Spray a bundt pan and a 9″round cake pan with vegetable oil spray and dust with flour; gently tap out excess flour. In mixing bowl whisk together flour, baking powder, baking soda, salt, and spices; make a well in the centre. In a small mixing bowl combine oil, honey, sugars, eggs, vanilla, coffee, orange juice and rum. Pour liquid ingredients into the well in dry ingredients, and mix on low speed for 1 minute then increase to medium speed and mix for another 3 minutes. Bake in preheated oven for 60 – 75 minutes for the Bundt pan, 30 – 45 minutes for 9″ round cake pan or until pick inserted comes out clean. Remove from oven to wire rack and allow to cool in pan for 10 minutes. Run knife around pan to loosen cake, turn out to cool completely on wire rack. When cake is completely cooled, drizzle with glaze, top with toasted almonds and dust lightly with icing sugar. 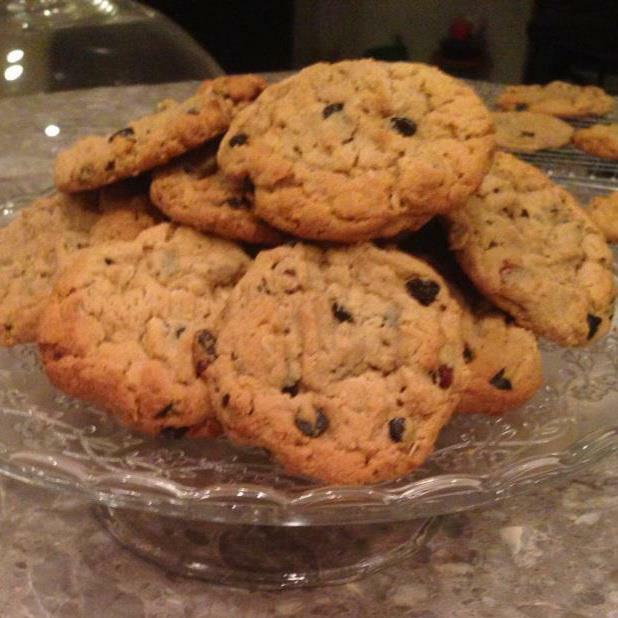 For original recipe head over to Smitten Kitchen. Melt honey, sugar and butter in heavy skillet over medium heat. Stir in vanilla and almonds; continue cooking for about 5 minutes, stirring constantly, watching for the almonds to start turning golden brown. Break into bite size chunks. I carefully spread the hot honeyed almonds on top of the cake and allowed it to cool completely before lightly dusting with icing sugar. Again, it was a bad idea as I basically had Almond Bark on the top of my cake. I definitely did not want to cook dinner tonight but since I already took LAST night off from cooking I HAD to get in the kitchen tonight! There was a pound of ground beef thawing in the fridge so at least I had a starting point…I hate it when you are racking your brain trying to suss out what to cook for dinner and you don’t even know where to begin so you start going through the entire contents of your fridge and pantry in your mind. For one, it usually gives you a huge headache. 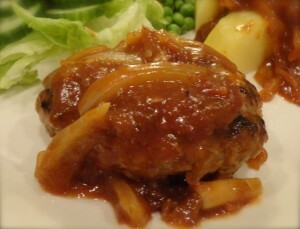 Alright, so knew I had to cook that ground beef (by the way, I take zero pleasure in cooking poor ol’ Bessy ); I started thinking about the things my mother used to cook with ground beef besides Cabbage Rolls, Meatloaf and Spaghetti Sauce…I was about to search google for ideas when I remembered Salisbury Steak! Not sure why they call it “steak” but whatever. In medium mixing bowl combine 2/3 of onion soup mix, ground beef, bread crumbs, egg, salt and pepper, and milk. Form into 6 oval patties. In large skillet over medium-high heat, brown both sides of patties, about 4 -6 minutes per side. When you flip the patties over to the second side, add sliced onions; stir onions around occasionally while browning second side. In measuring cup combine ketchup, water; whisk in flour, remaining onion soup mix and dry mustard powder. Pour over patties in skillet and bring to a boil; reduce heat, cover and simmer for 20 minutes, stirring occasionally. After a long day all you want to do is veg-out in front of the fire. This is a super easy and super quick meal to throw together to get you back in front of the fire in no time at all. Saute ground beef, onion and garlic in butter over medium heat in a large skillet. 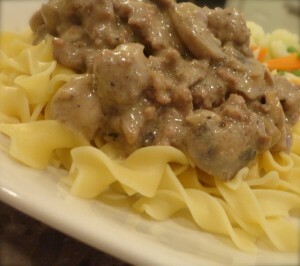 Stir in flour, salt, pepper and sliced mushrooms; continue cooking for another 5 minutes, stirring often. Stir in soup, add a bit of water if you feel it is too thick, bring to a boil, reduce heat and simmer, uncovered for 10 minutes. Stir in sour cream and tarragon; heat through. I have had it in my mind to make an Applesauce Cake for absolutely ages. On my last trip to the shops I even bought a great big bag of apples; truth be told, I have bought a big bag of apples a few times before but the Applesauce Cake just never seemed to materialize, go figure. It just so happens I had a few plans go awry on a Saturday and when you have to shift to Plan B, but wait, there was no Plan B; well, that is a good time to head to the kitchen and do some Baking! Coincidentally I had also just made a fresh batch of applesauce so I simply had to dig out the Applesauce Cake recipe. It used to be that I would flip through my Betty Crocker cookbook but in this day and age, I enter what I want to make in the google search field on MY iPad* and sift through the multitude of recipes on offer. Good Ol’ BC has an Applesauce Cake recipe for a 9×13 cake which I guess I could have used but I wanted a tried-and-true recipe for a bundt pan because I bought a bundt pan in June and it was still sitting in the cupboard, unused! I made only one substitution in this recipe and one addition: I used chopped dates instead of raisins and I added a layer of Cream Cheese Frosting to finish it off. 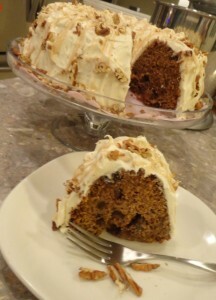 You see, the picture in the old BC cookbook has a lovely 9×13 Applesauce cake all decked out in Cream Cheese Frosting and sprinkled with chopped walnuts so I had this vision in my head of my Applesauce Cake being frosted rather than merely dusted with powdered sugar. 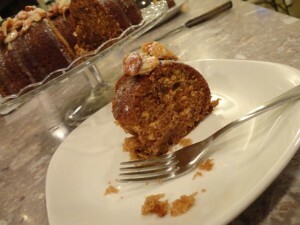 Many thanks to Cookie Madness for breaking away from Cookies and making an Applesauce Spice Bunt Cake. *My husband keeps absconding off to the bedroom with my iPad at the most inopportune times! And the nerve, sometimes he even closes down the pages I am using! I NEVER shut down his Geek pages! Spray a 10″ Bundt pan with vegetable oil spray, add 1 tablespoon of flour, tilting and lightly tapping pan to coat pan lightly with flour; turn out excess flour. In a medium mixing bowl combine flour, baking soda, salt, cinnamon and allspice; set aside. In mixing bowl beat butter until smooth then add sugar and continue beating for about a minute. Add brown sugar and resume beating for another 2 – 3 minutes until. Add egg and vanilla; beat until light and fluffy. Stir in applesauce on low setting. Turn mixer off, raise paddle and add the flour mixture; lower paddle and stir at lowest setting until well blended and no lumps remain. Stir in chopped pecans and dates. Turn batter out into prepared Bundt pan and bake in 350F oven for 60 – 70 minutes, until golden and pick inserted in centre comes out clean. Remove from oven and cool, in pan, on wire rack for 10 minutes. Turn out of pan onto wire rack and cool completely. Cream butter until soft and no lumps remain. On low speed, stir in 1 cup of icing sugar until incorporated. Add vanilla and continue stirring on low speed. Add another cup of icing sugar, again stirring until incorporated. Add final cup of icing sugar and a bit of milk, if needed. Beat on medium-high speed for 2 -3 minutes until light and fluffy. In medium mixing bowl combine flour, rolled oats, baking soda, baking powder, salt, cinnamon, and nutmeg; set aside. In large mixing bowl cream together butter, sugar and brown sugar; beat until light and fluffy. Gradually stir in dry ingredients, stirring well after each addition. Drop by heaped tablespoons onto prepared baking trays. Bake in 350F oven for 8 – 12 minutes, or until lightly golden. Makes about 3 dozen large cookies.